If you attended the 2015 Unicef UK Baby Friendly conference you may have noticed, or taken part, in the informal World Breastfeeding Trends Initiative (WBTi) competition to guess the final assessment score. Sue Ashfield is the winner as her estimate was closest to the actual score of 50.5 out of 100 for Indicators 1-10. The score is a measure of how the UK is performing against the implementation of key policies and programmes to support mothers who want to breastfeed and the healthcare professionals who help them. Sue is the lead and Specialist Health Visitor (Infant Nutrition) of First Community Health and Care in East Surrey. Sue is a winner in a much bigger way than the WBTi competition because her community team was reaccredited by Baby Friendly earlier this year and they also supported 10 local children centres in achieving full BFI accreditation in one year. The formal presentation of the award was on March 14th. Sue pays tribute to the hard work of her colleagues for the achievement but it also reflects her commitment and leadership. Read more here. Her team is a brilliant example of what the WBTi UK report recommends for Indicator 6 (community-based support). There is close, integrated working between 0-19 public health team, breastfeeding counsellors, peer supporters and children centres at the three Baby Cafes, which have been runnning for 10 years. Practitioners from the 0-19 team work at the Baby Cafes on a rota basis, alongside the breastfeeding counsellor. When they see mothers at home or at drop-in clinics they encourage them to attend the Baby Cafes for social support or more specialised support or just to chat to one of the peer supporters. The breastfeeding counsellors at the Baby Cafes have now trained over 200 peer supporters and this has increased the breastfeeding knowledge and skills within the local community. The photo above shows Sue holding the Baby Friendly Initiative (BFI) accreditation plaque along with some members of the 0-19 team, some senior managers and their BFI Guardian. Since April, all three community services in Surrey have come together as Children and Family Health Surrey to deliver children’s services. Sue comments that she found particularly useful the information in the WBTi report about interventions and investment offered in the past and also Report Cards and the summary gaps and recommendations. She will use the findings in the report to inform local commissioners and disseminate information to staff and other stakeholders. An integrated service like this is needed in all areas, yet in so many places services are being cut, particularly peer support programmes and breastfeeding support drop-ins. I have been reflecting recently on my experiences as a specialist health visitor and infant feeding lead in an outer London borough. The story began twelve years ago, in 2005, when there was a lack of confidence among mothers and staff about the reliability of breastfeeding, which was hidden and rarely seen in public. Over the next eight years, the initiation rate increased from 67% in 2005 to 86% in 2013, and the continuation rate at 6-8 weeks from 50% to 75% (52% breastfeeding exclusively). Breastfeeding became the way most mothers fed their babies. Gradually breastfeeding mothers became visible in cafes, shopping centres, supermarkets, streets, GP surgeries and children’s centres. The Unicef Baby Friendly Initiative assessors stated in a report that, in this borough, breastfeeding had become ‘the normal way to feed babies’. How did this change come about in a relatively short period of time? It began in 2005, as a joint project between the NHS and NCT, which secured local health authority funding to set up a breastfeeding support group in an area of social deprivation with low breastfeeding rates. This group became very well attended and was facilitated effectively by two NCT breastfeeding counsellors and a health visitor. A similar group was set up in another part of the borough and was run by me, together with other health visitor colleagues. Many of the mothers were very grateful for the support they received in the groups and some of these women expressed the wish to train as volunteer peer supporters, so that they could help other mothers enjoy breastfeeding their babies, as they had. Two training courses were organised and, that year, 20 peer supporters were trained, registered by the voluntary services of the local Primary Care Trust (PCT), and started working in breastfeeding support groups, in the children’s centres and health service clinics. The news of the training spread rapidly and soon there was a waiting list of mothers wishing to train! The numbers of groups expanded to be easily accessible to mothers across the borough, running every weekday, in children’s centres, cafes, and health premises. The new peer supporters brought fantastic skills with them, one setting up a website, another a mothers’ Facebook page and another designing our leaflets and posters! One had breastfed twins and set up antenatal sessions for parents expecting multiple births plus a weekly support group for mothers with twins and more. She also visited these mothers at home and lent them cushions, which helped them tandem feed. Soon the exclusive breastfeeding of twins and even triplets became common. A group of Somali mothers was trained and an outreach peer supporter started seeing Somali pregnant women in the hospital. A teenage ‘buddy’ scheme was also started by some of the younger peer supporters, working with the specialist midwife and running antenatal sessions and postnatal support for young mothers. Two peer support co-ordinators were employed to job-share this important role and to deal with concerns of the peer supporters as well as helping with training and supervision. Over the next ten years, more than 200 voluntary peer supporters were trained in the borough and the training continues until the present day. In 2006, under the government scheme of “Every Child Matters’, the Director of Public Health made breastfeeding the top priority for all children in the borough with accompanying ‘stretch targets’ and funding. In 2012 Unicef UK Baby Friendly Initiative carried out a major review that resulted in new, more holistic, child rights-based standards relating to the care of babies, their mothers and families, with a strong emphasis on building responsive loving relationships. A new award has also been introduced to encourage a focus on sustainability after the accreditation. In parallel with the rapidly increasing numbers of peer supporters, the journey in the borough to become Unicef Baby Friendly (BFI) accredited started and professional training in the community and local hospital began with the two health trusts starting their journeys jointly. A model of multidisciplinary training of midwives, maternity assistants, neonatal nurses, nursery nurses and health visitors began initially with BFI-facilitated training. This enabled hospital and community staff not only to improve their breastfeeding knowledge and skills, but also each other’s roles, co-operate on work challenges and break down any barriers which may have existed previously. Communication skills and talking about their own life experiences, in order to gain an understanding of their impact, especially with infant feeding, became an important part of the in-service training. Interactive group exercises on different breastfeeding situations became an integral part of the training, emphasising the importance of empathy and seeing the problems through the eyes of the mothers. A neonatal breastfeeding co-ordinator was appointed and started training all the neonatal staff in the hospital, including the doctors, and by 2014, Unicef had awarded both the community and hospital trusts their Baby Friendly accreditation. Peer supporters were also employed by an adjacent borough to work in the hospital, supporting mothers on the postnatal ward, one even working all night once a week; others taught hand expressing and colostrum harvesting in the antenatal clinic, especially for mothers with diabetes. Within ten years, breastfeeding became a normal and accepted way to feed babies in the borough. Mothers, fathers, and grandmothers-to-be came in large numbers to the twice monthly breastfeeding workshops, gaining confidence and information, with the expectation of the support that would be available to them to help them achieve their goals. A mother said ‘the session expelled myths and I now know how milk is made and transferred to my baby. I am looking forward to skin-to-skin contact after the birth and will follow my baby’s instincts’. Parents meet peer supporters in the support groups, at toddler groups, in the school grounds, in cafes, at sports events, in churches, temples, synagogues and mosques. Peer supporters live and work in the community and spread their knowledge through everyone they meet. Even when they move away from peer support, they take their embodied knowledge into the work place and support their colleagues there. Cultural change can happen through peer support, resulting in breastfeeding becoming embedded in a community. This change is sustainable over time and in future generations, as it spreads through different social groups. Voluntary peer support and informed, professional support is capable of changing attitudes and behaviour within a community to make breastfeeding ‘normal’ in a very cost-effective way. Commissioners need to be aware of how health outcomes can be improved through breastfeeding, for mothers and children, in the immediate and long-term, and it is essential to protect and increase future funding for midwives, health visitors and peer supporters, in order that vital programmes like this can continue. 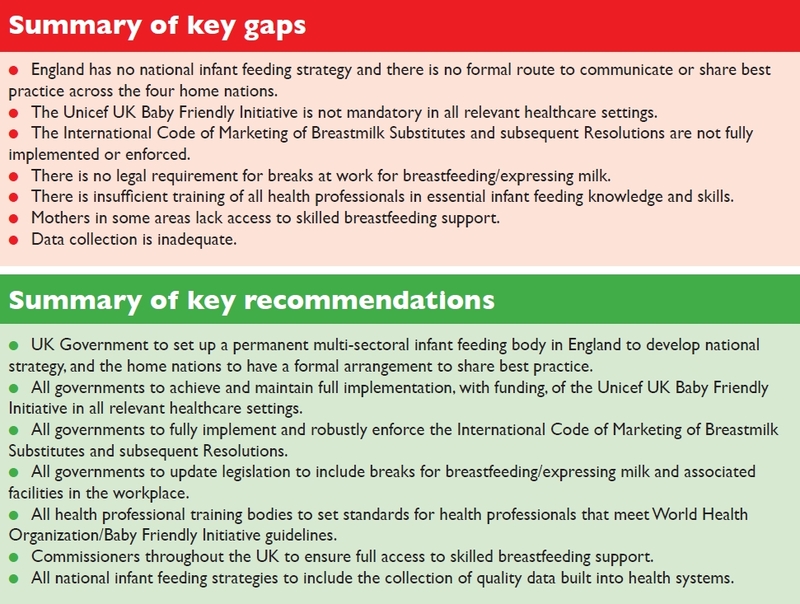 The World Breastfeeding Trends Initiative UK report in 2016 affirmed the borough’s actions as it recommends in Indicator 6 (Community-based support) that ‘commissioners ensure that there is a range of postnatal services that include both health professional and voluntary-sector breastfeeding support to meet local needs and provide clear access to specialist support’ and that they ‘maintain the full range of health visiting services, and maintain health visiting as a universal service’. Indeed, the borough’s transformation in breastfeeding support is used as a case study in Part 2 of the report. There’s so much to celebrate about breastfeeding, and for me one of the most special things is how much we can learn from each other as mothers. Of course there is information everywhere, often far too much of it, and there are medical professionals to give technical support, check our babies’ health, and prescribe any treatments that are needed. But in my time as an LLL (La Leche League) Leader, I’ve noticed that passing on pure information is a tiny part of what we do. What brings mothers to our meetings, and turns them into loyal regulars, is the talking – the chance to share their strong feelings about their unique developing breastfeeding relationships. The simplest of questions: “how do you know when your baby wants to nurse?”; “what surprised you most about breastfeeding?” can easily set off half an hour of discussion. Dazed new mothers with tiny newborns share their shock and wonder; seasoned mothers on their third child talk about how still, every day, there’s something new. And of course mother to mother conversations like these provide a safe space for complaining. As one mother put it to me: “LLL meetings are the only place where I can sit and moan about breastfeeding without being instantly told to wean”. When a group starts from a safe shared understanding that breastfeeding matters, and a shared knowledge of its many joys, this gives a context that makes it acceptable to explore the lows, too. The support of peers can also give a rich source of alternative methods and ways to approach breastfeeding-related problems. A mother suffering through a nursing strike can find a “standard list” of solutions online easily, but there’s a whole extra dimension when she can describe it to other mothers who are right there with her. She can show her child other busily nursing babies, and can talk about any mixed feelings she has – perhaps she’s wondering if this might be a chance to wean that she’ll later regret not having taken, or she might be wondering what effect this will have long term on their breastfeeding relationship. Finally, she might return to the next month’s meeting glowing with happiness as she and her baby are back in tune, all is well, and she has added to her stock of experiences to share with the next mother. Support from medical and lactation professionals has a crucial place; in times of serious need, specialist help from a lactation consultant can be literally life-saving. And sometimes, in the middle of the night, reaching out to strangers on the internet can be enough to get through. But for everything else, there’s mother to mother support. It’s embedded in its community, and forms a community of its own within that. Mothers come to LLL meetings nervous, uncertain, clutching newborns and wondering what to expect; sometimes they’re still with us years later, bringing all their successive children, perhaps becoming LLL Leaders themselves, or perhaps just carrying on the conversation, and passing on the support to new versions of themselves. To recognise the importance of support, mothers are invited to share their photos and stories of support from their own “breastfeeding best friend” on social media, using the hashtag #bffriend17. I received too much breastfeeding support – said no mother ever! I did not realise the power of that statement until I became a breastfeeding mother. Nursing my child became a life philosophy, a kaleidoscope lens, spinning my family, bringing like-minded people together and painting the colours of my parenting. About 3 years ago there was a story all over the media about a mother who was asked to leave a certain store because she chose to breastfeed openly in there. Breastfeeding mothers on social media were furious. Simultaneous protests in branches of that store were set up and I organised one of them. Some great friendships were born out of that movement. This simple act sparked a discussion about the needs of the breastfeeding community. This could not end there. We wanted to make sure mothers knew their rights. We wanted to educate, empower and bring families together. Slowly a community has been born. It kicked off with a picnic to celebrate National Breastfeeding Week, followed by some meetings in a children’s centre. A year passed and having my third baby gave me a huge boost of confidence to put my peer support training into practice. After another season of outdoor gatherings, I hired a room in a community centre. One of the mothers got inspired and started another group in a nearby town, followed by more of them. All were hosted by mothers who breastfed their own babies and felt they could support others and offer a safe space for befriending. A few months later we decided to organise peer support training. The services offered by the local health visiting team and children’s centres were not sufficient at the time. And there definitely was a niche for peer support. Having experienced first hand how unique it is having another mother support you through hardships, I fell in love with the idea. We approached other service providers using the Maternity Services Liaison Committee. At first, not many believed in us but, as time passed, we proved to be worthy of their trust. We asked for help from generous friends, who delivered the training at no charge, and we found a venue for free thanks to a children’s centre manager. But mostly we were incredibly lucky to recruit, through our groups, amazing women who agreed to offer their time to volunteer in the local hospital. We decided it was the right time to create something more formal. West Herts Breastfeeders community came to life thanks to the many mothers who nurtured it deeply. This ‘baby’ was very lucky. It was a firstborn who had all the attention and support from local Infant Feeding teams and the Children’s Services department of Hertfordshire County Council. We came a long way. It took us just over a year to train 18 peer supporters, establish six monthly regular meetings in the West Herts area, recruit nearly 550 members to our virtual community to provide them with 24 hour support through Facebook and all that with no official funding. We are all volunteers. You could be too! As mentioned in the Open Letter of February 2016, organised by the WBTi UK team, a woman’s ability to breastfeed is often determined by the support she receives and the environment in which she lives. While we cannot change everything, we try to help normalise breastfeeding out and about. We also play an important role in normalising feeding older babies and encouraging mothers to carry on, while often dealing with family pressures to wean or the challenges of returning to work. Most children’s centres provide breastfeeding support only in groups for babies under one year, and health visitors do not see mothers as often as they would like. Not having a healthcare professional label also changes the balance of the dialogue and helps mothers to open up. What we strive for in the face of recent cuts and challenges is the partnership between all local services. Our success is owed largely to the power of networking. We can see where we are needed most and what else can be done to make sure no woman is left alone at any stage of her nursing journey. You can help to be part of the change, by simply sharing your thoughts with your newly elected MP. Use the WBTi sample email to tell them what breastfeeding mothers need in your local area. Ask them to use their influence on the Local Authority to showcase the importance of breastfeeding to public health and safeguard their budget for health visiting and breastfeeding support. Please sign up HERE to receive email updates on our WBTi work! Doctors have to acquire a huge body of knowledge during training and for general practitioners that knowledge is particularly wide-ranging. Their ten or more years of study comprise undergraduate, foundation and specialism levels of training. As qualified GPs they are likely to have thousands of women patients who, at some stage, are breastfeeding mothers, yet the breastfeeding content of the curriculum is minimal. Placements in the specialism training may offer useful opportunities to learn from midwives and health visitors about the practicalities of supporting breastfeeding but this is a matter of luck, and the knowledge and skills of those mentors can be variable. It would be much more effective to have a requirement for acquiring basic knowledge and skills specified in the curriculum as well. A number of GPs, mothers who in breastfeeding their own babies became acutely aware of the deficiencies in their training, set up the GP Infant Feeding Network, GPIFN, in February 2016. In April 2017 they launched the GPIFN website, a valuable resource for doctors. Does your doctor know about this website? With regard to medical training (not just GP training), the General Medical Council (GMC) has recently published its Generic Professional Capabilities (GPC) Framework to provide broad outcomes for a consistent approach for postgraduate curricula. The framework was developed in partnership with the Academy of Medical Royal Colleges. Domain 4 (there are 9 domains) looks to be particularly relevant to protecting and supporting breastfeeding as its title is ‘Capabilities in health promotion and illness prevention’. Royal colleges, such as the Royal College of General Practitioners (RCGP), are responsible for the details of their curricula. They revise them every few years and from the next revision will need to fit with the GPC Framework to be approved by the GMC. The current standards show several gaps when evaluated by the WHO Education Checklist on infant feeding in the 2016 WBTi assessment of the UK. Further information about standards for the different health professions can be found in Indicator 5 in Part 2 of the 2016 WBTi report. Are you a doctor or trainee doctor? If so, you might like to contact your specialty college asking for the infant feeding content of the curriculum to be improved. Patricia Wise is an NCT breastfeeding counsellor and a member of the WBTi Steering Group, being the lead for Indicator 5, which is primarily about health professional training.